Brian Cowen vows to lead Fianna Fáil into the next election – but cabinet colleague Micheál Martin says it’s time for change. 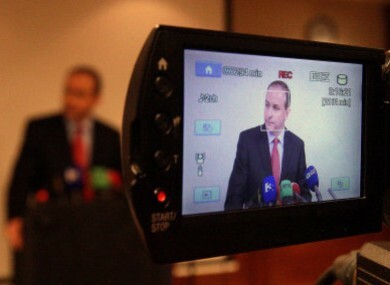 Micheál Martin speaks to the media at the Burlington Hotel last night, announcing his intention to vote against Brian Cowen in Tuesday's motion of confidence. THE BATTLE for the leadership of Fianna Fáil began in earnest last night after Micheál Martin publicly challenged Brian Cowen’s tenure, and said he would be voting against the Taoiseach in a critical party vote on Tuesday. Cowen yesterday announced his intention to remain on as leader of Fianna Fáil into the next general election, and said he will table a motion of confidence in himself at a meeting of its parliamentary party this week. But last night at a press conference in the Burlington Hotel, foreign affairs minister Martin broke cover and became the first cabinet minister to publicly call for Cowen to step down, insisting that the “very survival of the party is at stake”. Saying he had discussed the party’s future on a number of occasions with the Taoiseach in the past few days, Martin said there was “huge concern about the way of the party” among its TDs and senators – and said he had offered his resignation as Foreign Affairs minister, but that Cowen had not chosen to accept it. “I have reluctantly concluded that in these circumstances, Fianna Fáil should change its leader before the election,” Martin said, adding that he felt his views were reflected within the wider party. Though Martin had been approached by other members of the Fianna Fáil party about trying to replace the leadership within “the last 12 to 18 months”, he had rebuffed any advances, insisting that the country’s financial issues – and the ongoing concern about an IMF bailout – had meant there were more pressing issues facing the country and the party. Now that the bailout had been finalised, however, Martin felt that the Finance Bill – which marks the largest part of the Budget – could be passed within the coming weeks, making the prospect of discussing the party leadership more viable. On RTÉ’s The Week in Politics last night, Martin said he had finally decided to challenge Cowen’s premiership after being approached by other senior members of the party, who had appealed that “somebody had to do something” to arrest the party’s slow decline. Martin further told Ryan Tubridy this morning that he was “confident” the motion in favour of Cowen would be “narrowly lost”. This morning, junior minister Billy Kelleher also nailed his colours to the mast, saying his party “must recognise the current climate of public opinion” and said the time had come to change the party leader. “A change of party leader at this time will allow Fianna Fáil to engage more fully with public opinion and better communicate its policy perspectives in advance of the polls,” the trade minister said, adding that he believed his view was that of “the majority of my colleagues”. Martin’s comments followed Cowen’s earlier declaration that he would remain at the helm, following his weekend of “excellent discussions” with party TDs and senators, had led him to decide that the party would be best served by his continuing in power. When pressed, Cowen refused to discuss whether he would retain ministers who were willing to publicly oppose him – a remark which, as it emerged, came after the Taoiseach had twice spoken to Micheál Martin, who had offered his resignation from the Cabinet. Tuesday’s vote, he said, would resolve the leadership tensions within the party once and for all, and allow it to focus on completing its legislative programme and on its general election campaign. Cowen himself later told The Week in Politics that he was “very satisfied that when this is over, I will have a ringing endorsement of my leadership” – and revealed that he had the full support of Brian Lenihan, another cabinet member seen as a potential frontrunner for the top job. In a statement released during Micheál Martin’s press event, the Green Party said it was ‘standing back’ in order to allow its government partner “order its own affairs”, but said it was looking forward to an “early and definitive solution”. The increasingly under-fire Taoiseach had come under further pressure to step down over the weekend, with Cork North-Central TD Noel O’Flynn adding his name to the growing list of TDs seeking an alternative leader for the next general election. Email “Fianna Fáil battle begins as Martin declares intent”. Feedback on “Fianna Fáil battle begins as Martin declares intent”.